BBC Music Magazine: Editor's Choice; Gramophone: outstanding; International Record Review: outstanding; Music Web International: outstanding; Klassik-heute 10/10/10. Martin Fröst’s latest releases feature the core repertoire for his instrument from the 18th and 19th centuries: the Mozart Concerto and Quintet, Brahms’s sonatas and, most recently, Weber’s concertos. All of these offerings have been singularly well received by reviewers and record buyers alike, and have contributed to Fröst’s flourishing concert career. While his concert programmes certainly include the works of Brahms, Schumann and their likes, Fröst is however also known as one of today’s most charismatic performers of contemporary music, and on this disc he shows us why. Combining two great Scandinavian works for the clarinet, from 1928 and 2005 respectively, he makes a passionate case for music as a timeless and universal means of communication. In marked contrast, Kalevi Aho’s Concerto, composed for Fröst some 80 years later, was immediately hailed as ‘a masterpiece’ at its première, in London in April 2005: ‘Until you've heard Martin Fröst, you really haven't heard the clarinet. This young Swedish musician becomes the clarinet. His entire body moves and breathes with the instrument - and he creates sounds the likes of which you will go a very long way to hear… It's a mark of Fröst's imagination and genius that he chose the Finnish composer Kalevi Aho to write him a clarinet concerto... a work of beguiling beauty and huge excitement’ (The Times, UK). 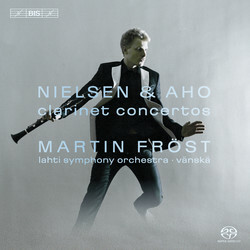 Supporting Fröst in both works is the Lahti Symphony Orchestra under Osmo Vänskä, whose expertise in the music of both Kalevi Aho and Nielsen is well documented, in the concert hall as well as on disc.